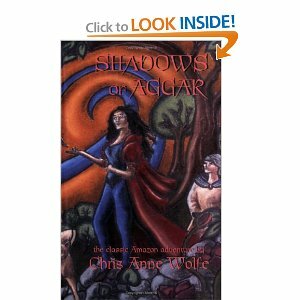 I highly recommend Shadows of Aggar by Chris Anne Wolfe to all readers of lesbian fantasy and science fiction. It's a very well written story and an interesting and engaging romance. Shadows of Aggar is the first book in the Amazons of Aggar series, named for the 'Shadows' who dedicate their lives to adventure and supporting a specific person. The two Amazons of Aggar books by Chris Anne Wolfe are a particularly well known lesbian science fiction series from a groundbreaking author. Sadly, she died of cancer, cutting her writing career far too short, and leaving the last book in the trilogy unwritten. Aggar is a fairly medieaval world kept in controlled seclusion from the wider galaxy - it exists in an uneasy quarantine within the Terran Empire, and sits very near the contested border to another galactic empire. The reclusive and mystical Council do their best to keep the Terran Empire out, without actively jeopardising the truce, and to guide the various planetary cultures and peoples into balance and towards a more harmonious and enlightened future. Keeping the existence of the wider galaxy secret is an integral part of this. When an operative of the Terran empire crashes on Aggar while returning with information of a pending assassination, the Council is moved to act - not only to prevent an invasive Terran rescue mission, but to avoid cultural contamination, while hurrying to retrieve the spy in order to avert galactic war between the two empires, which Aggar would be caught in the middle of. So they decide to allow and assist a single undercover offworlder to go after the missing man - and to give them a Shadow, Elana. They pick the Amazon - Diana n'Athena, or Di'nay - as they trust her over the Terrans. The Amazons are galactic representatives of a similarly separate, but more integrated, world that works with, but does not identify with, the Terran Empire. Founded on the ideals of long ago Amazons, sisterhood, equality and feminism, it is a completely female society, and apparently quite enlightened. The Amazons are selected to present an intimidating and consistent appearance to the wider galaxy. The rest of the women are a perfectly normal range of humanity. Sappho gets a mention, along with some of the (female) Greek gods. Diana is a middle aged, emotionally exhausted and cynical operative who has been working undercover on Aggar for about four years, after many years of similar missions around the galaxy. Tall and powerful, she is easily able to pass for a man, but finds the traditional chauvinism of her adopted society very painful. Especially when she is the unwilling participant of it, in her male guise. Unfortunately, lesbianism is almost unheard of and considered terrifying and unnatural by the few who discover her - her 'male' role, and this revulsion, leads Di'nay to walk in perpetual fear of forcing another woman into complying against their desires. So when she is presented with a young, apparently naive and traditionally brainwashed girl, she cannot accept or trust that yes, it's really okay for them to be lovers. Her internal struggles, and lack of understanding - including some fairly understandable cynicism - cause Elana a fair bit of pain. Elana is a psychically gifted young woman who has been training to become a Shadow for her unknown Shadowmate for most of her life. This involved everything from looking after a child, to fighting with sword and bow, as Shadows dedicate themselves to providing whatever their Shadowmate will need, whether guardian, partner, guide, servant or lover. Not only is the commitment enormous, it is also one way. Possessed of the Blue Sight, a very powerful mental ability that colours her eyes blue and allows her to read thoughts, create illusions, and feel the life flows around her, among other things. She has also been having visions of Di'nay since she arrived on Aggar and there was no question as to who would be assigned to her. It was a little difficult to remember, as the story went on, just why Elana would have dedicated herself to Di'nay - it was an enormous commitment, that would probably leave Elana broken or dead at the end, when Di'nay left. The pace of the story was fairly slow, with plenty of space dedicated to the character growth and emotional interactions of the two women - Di'nay gets quite frustrating! But the travel time and emotional parts of the story distracted from the main plot, even while building a richer tale (which is why most books tend to skip the many days of riding and gradually learning to understand each other!). Fascinatingly, the local people of Aggar have evolved to have more efficient metabolisms, a tendency to bear twins - and a skin colour that darkens with emotion, rather than environmentally or racially. By default, pale skinned, they darken through caramel to cocoa with exertion, joy or anger - Di'nay's tan gives people the impression that she has a temper! There are some very interesting feminist issues and undercurrents throughout the story - from tghe structure Diana's homeworld society, to her perceptions of women's roles on Aggar - to her initial rejection of Elana's attempts to do anything that might be interpreted as serving her, even offering her tea. There was a slightly surprising number of proof reading errors - mostly missed words, which made some sentences confusing, as the speech was often somewhat formal or slightly archaic. The very frequent jumps back and forth between the two women could also be confusing. I was also reading the eBook version, which could have been the cause behind most of the editing issues. Overall, an extremely enjoyable science fiction story, with strong fantasy elements. If you enjoy sword and sorcery, this is a good book to try - the setting and characters were unique and held together well. The sequel, Fires of Aggar, is set generations into the future, with the Amazons coming en masse to the resuce of Aggar, when the galactic empires finally start disintegrating. Elana and Di'nay are long gone, but their legacy lives on, and of course, there's a new romance! I am looking forward to reading it! Shadows of Aggar was a finalist in the Lesbian Science Fiction & Fantasy category, 4th Lambda Literary Awards.